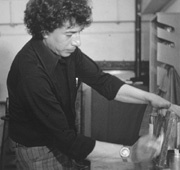 Rodolfo Nieto Labastida was born in Oaxaca on July 13, 1936. His youth was spent in Mexico City where he studied under the direction of Diego Rivera and later became his assistant. He also studied at the Escuela de Pintura y Escultura La Esmeralda where he became a disciple of Carlos Orozco Romero. In the 1960´s he decided to move to Paris where he studied at the Ecole de Paris, where he found his theme in the magic symbolism of his ancestors using alebrijes and other forms of folk art as his inspiration. In Europe he learned etching at the "Atelier 17" under Stanley William Hayter and lithography under Michel Case. He won at the Biennale de Paris in 1963 and again in 1968. In 1970 he won the Biennale de Caen and the Biennale de Menton. That same year, Nieto returned to Mexico where he studied pre-Columbian culture and popular art. He used oils, pencil, pastel and various mixed techniques in his graphic arts. Despite the recognition he had gained in Europe, however, he was rejected by critics back home. With the help of his wife Nancy, Nieto continued to try to establish himself as a serious artist in Mexico creating hundreds of works day in and day out. He slept little and started behaving erratically after some time. His depression spiraled out of control until his death on June 24, 1985. Today, he is considered to be one of the artistic generation that looked for the renovation of the Modern art of the 20th century with such as Rufino Tamayo, Francisco Toledo, Sergio Hernández, Rodolfo Morales and Jesús Urbieta. His work has achieved new meaning with critics as one of the first great artists from Oaxaca.